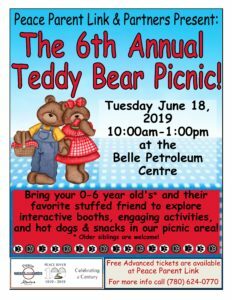 Peace Parent Link and Partners are excited to bring the 6th Annual Teddy Bear Picnic! Parents and Caregivers of children ages 0-6 are invited to bring them and their favorite stuffed friend to the picnic! This years picnic will be held at the Belle Petroleum Centre on June 18th from 10:00-1:00. This interactive event will have many fun activities, games and crafts. Get your free tickets at Peace Parent Link beginning April 1st!